"Royal Arms" redirects here. For other uses, see Royal coat of arms. The Royal Arms as shown above may only be used by the Queen herself. They also appear in courtrooms, since the monarch is deemed to be the fount of judicial authority in the United Kingdom and law courts comprise part of the ancient royal court (thus so named). Judges are officially Crown representatives, demonstrated by the display of the Royal Arms behind the judge's bench in almost all UK courts; notable exceptions include the Supreme Court of the United Kingdom, which displays its own badge and flag to symbolize its nationwide role, the magistrates' court in the City of London, where behind the Justices of the Peace stands a sword upright flanked by the arms of the City and the Crown. In addition, the Royal Arms cannot be displayed in courtrooms or on court-house exteriors in Northern Ireland, except for the courtrooms of the Royal Courts of Justice in Belfast and the courts in Armagh, Banbridge, Downpatrick, Magherafelt, or Omagh, and the exterior of court buildings that had them in place prior to the 2002 law. 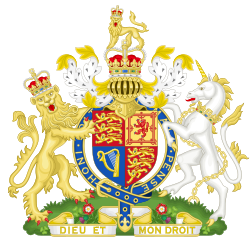 As the United Kingdom is governed in the monarch's name, the British Government also uses the Royal Arms as a national symbol of the United Kingdom, and, in that capacity, the coat of arms can be seen on several government documents and forms, passports, in the entrance to embassies and consulates, etc. However, when used by the government and not by the monarch personally, the coat of arms is often represented without the helm. This is also the case with the sovereign's Scottish arms, a version of which is used by the Scotland Office. 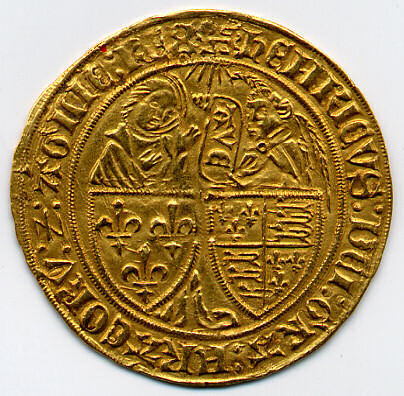 The Royal Arms have regularly appeared on the coinage produced by the Royal Mint including, for example, from 1663, the Guinea and, from 1983, the British one pound coin. In 2008, a new series of designs for all seven coins of £1 and below was unveiled by the Royal Mint, every one of which is drawn from the Royal Arms. The full Royal Arms appear on the one pound coin, and sections appear on each of the other six, such that they can be put together like a puzzle to make another complete representation of the Royal Arms. The monarch grants Royal Warrants to select businesses and tradespeople which supply the Royal Household with goods or services. This entitles those businesses to display the Royal Arms on their packaging and stationery by way of advertising. It is customary (but not mandatory) for churches throughout the United Kingdom whether in the Church of England or the Church of Scotland to display the Royal Arms to show loyalty to the Crown. A banner of the Royal Arms, known as the Royal Standard, is flown from the royal palaces when the monarch is in residence, Windsor Castle and Buckingham Palace being her principal abodes; and from public buildings only when the monarch is present. This protocol equally applies to the monarch's principal residences in Scotland (the Palace of Holyroodhouse and Balmoral Castle), where the Royal Standard (Scottish version) is flown. When the monarch is not in residence the Union Flag, or in Scotland the ancient Royal Standard of Scotland, is flown. The widely sold British newspaper The Times uses the Hanoverian Royal Arms as a logo, whereas its sister publication, The Sunday Times, displays the current Royal Arms. The Royal Arms are also displayed in all courts in British Columbia, as well as in other Canadian provinces such as Ontario, where the judges are appointed by Crown authority. The Royal Arms were also displayed by all Viceroys of Australia as representation of their Crown authority. The Royal Arms are also used and displayed most state Supreme Courts across Australia. The Royal Arms are also the coat of arms for the Western Australian Legislative Council. The Royal Arms were controversially used by former Prime Minister Margaret Thatcher as her official letterhead from c. 1997. Since the Union of the Crowns in 1603, a separate version of the Royal Arms has been used in Scotland, giving the Scottish elements pride of place. The shield is quartered, depicting in the first and fourth quarters the lion rampant of Scotland; in the second, the three lions passant guardant of England; and in the third, the harp of Ireland. 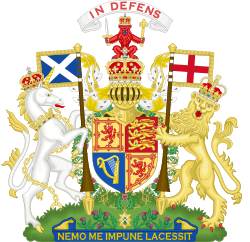 The crest atop the Crown of Scotland is a red lion, seated and forward facing, itself wearing the Crown of Scotland and holding the two remaining elements of the Honours of Scotland, namely the Sword of State and the Sceptre of Scotland. This was also the crest used in the Royal Arms of the Kingdom of Scotland. The motto, in Scots, appears above the crest, in the tradition of Scottish heraldry, and is an abbreviated form of the full motto: In My Defens God Me Defend. The supporters change sides and both appear wearing the crowns of their respective Kingdom. The dexter supporter is a crowned and chained unicorn, symbolising Scotland. 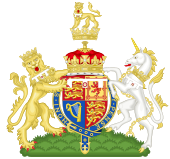 The sinister supporter is a crowned lion, symbolising England. Between each supporter and the shield is a lance displaying the flag of their respective Kingdom. The coat also features both the motto Nemo me impune lacessit (No one wounds (touches) me with impunity) and, surrounding the shield, the collar of the Order of the Thistle. On the compartment are a number of thistles, Scotland's national flower. Unlike the Acts of Union 1707 with Scotland, the Acts of Union 1800 with Ireland did not provide for a separate Irish version of the royal arms. [dubious – discuss] The crest of the Kingdom of Ireland (on a wreath Or and Azure, a tower triple-towered of the First, from the portal a hart springing Argent attired and unguled Or) has had little or no official use since the union. 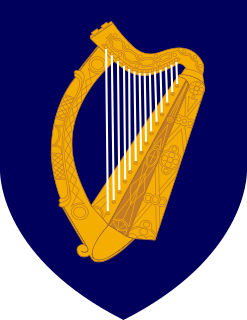 The harp quarter of the Royal Arms represents Ireland on both the English and Scottish versions. Likewise, one English quarter is retained in the Scottish version, and one Scottish quarter is retained in the English version. Thus, England, Scotland and Ireland are represented in all versions of the Royal Arms since they came under one monarch. When the Irish Free State established its own diplomatic seals in the 1930s, the royal arms appearing on them varied from those on their UK equivalents by having the Irish arms in two quarters and the English arms in one. By contrast, there is no representation at all for Wales in the Royal Arms, as at the Act of Union 1707 Wales was an integral part of the Kingdom of England pursuant to the Laws in Wales Acts 1535 and 1542; thus, it has been argued Wales is represented in the English coat of arms. However the argument is somewhat disengenuous as in 1535 the Welsh Dragon was already part of the Tudor Coat of Arms. Upon the accession of the Tudor monarchs, who were themselves of Welsh descent, a Welsh Dragon was used as a supporter on the Royal Arms. This was dropped by their successors, the Scottish House of Stuart, who replaced the Tudors' dragon supporter with the Scottish unicorn. In the 20th century, the arms of the principality of Wales were added as an inescutcheon to the coat of arms of the Prince of Wales, and a banner of those arms with a green inescutcheon bearing the prince's crown is flown as his personal standard in Wales. The so-called Prince of Wales's feathers are a heraldic badge rather than a coat of arms upon a shield, but they are not Welsh in any case. They derive, in fact, from the English Princes of Wales (who may owe them to an exploit of Edward, the Black Prince at the Battle of Crécy) and carry the motto Ich dien (German, "I Serve"). In any event, they do not form part of the Royal Arms, as opposed to the heraldic achievement of the Prince of Wales, who drops them upon his accession as King. The current royal arms are a combination of the arms of the former kingdoms that make up the United Kingdom, and can be traced back to the first arms of the kings of England and kings of Scotland. Various alterations occurred over the years as the arms of other realms acquired or claimed by the kings were added to the royal arms. The table below tracks the changes in the royal arms from the original arms of King Richard I of England, and William I, King of Scots. c. 1189 Possible interpretation of the arms shown on King Richard I's first Great Seal. These are the arms of Plantagenet, of which family Richard was a member. The tinctures and the number of charges shown in this illustration are speculative. 1198–1340 The arms on the second Great Seal of King Richard the Lionheart, used by his successors until 1340: three golden lions passant gardant, on a red field. King Edward III quartered the Royal Arms of England with the ancient arms of France, the fleurs-de-lis on a blue field, to signal his claim to the French throne. 1377–1399 King Richard II impaled the Royal Arms of England with the arms attributed to King Edward the Confessor. 1399–1422 King Henry IV updated the French arms to the modern version, three fleurs-de-lis on a blue field. 1470–1471 King Henry VI impaled the French and English arms, using the same arms after his "readeption". 1471–1554 King Edward IV restored the arms of King Henry IV. 1554–1558 Queen Mary I impaled her arms with those of her husband, King Philip of Spain. Although Queen Mary I's father, King Henry VIII, assumed the title "King of Ireland" and this was further conferred upon King Philip, the arms were not altered to feature the Kingdom of Ireland. 1558–1603 Queen Elizabeth I restored the arms of King Henry IV. 12th century – 1558 A red lion, rampant, on a yellow field within a double royal tressure, flory counter-flory, first used by King William I, and later by his successors, and becoming the heraldic representation of Scotland. 1558–1559 Mary, Queen of Scots, Dauphine of France, impaled with the arms of Francis, Dauphin of France, King consort of Scots. 1559–1560 Mary, Queen of Scots and Queen consort of France. She also for a short time quartered the English arms in France. See Mary, Queen of Scots#Claim to the English throne. 1560–1567 Mary, Queen of Scots and Queen dowager of France. 1567–1603 Upon her (second) marriage to Henry Stuart, Lord Darnley, in 1565, Mary discontinued the arms of Scotland and France impaled, reverting to those of the Kingdom of Scotland. King James VI was the last monarch of Scotland to use these arms before the Union of the Crowns in 1603. These novel arms, already in use by parliamentarians in 1648, were adopted by the Commonwealth of England established in 1649. The Commonwealth of England, Scotland and Ireland (the Protectorate) was created in 1653. St Andrew's Cross was added to the arms in 1654. 1655–1659 The arms of the Commonwealth from 1655 to 1659. Struck in 1655, the Great Seal included the personal arms of Oliver Cromwell on a shield in the centre. Blazon: Quarterly 1 and 4 Argent a Cross Gules (England) 2 Azure a Saltire Argent (Scotland) and 3 Azure a Harp Or Stringed Argent (Ireland) on an Inescutcheon Sable a Lion Rampant Argent (Cromwell's arms). The supporters were a crowned lion of England and a red dragon of Wales. 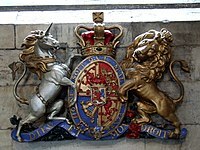 The Scottish unicorn was removed, as it was associated with the Stuart Monarchy. The motto read PAX QUÆRITUR BELLO ("peace is obtained through war"). Following the Protectorate, the 1654 arms were restored. 1603–1689 Charles II restored the Royal Arms following the restoration after the civil wars. 1689–1694 King James II & VII is deposed and replaced with his daughter Mary II and her husband, William III. As King and Queen they impaled their arms: William bore the Royal Arms with an escutcheon of Nassau (the royal house to which William belonged) added (a golden lion rampant on a blue field), while Mary bore the Royal Arms undifferenced. 1694–1702 After the death of Mary II, William III reigned alone, and used his arms only. 1702–1707 Queen Anne inherited the throne upon the death of King William III & II, and the Royal Arms returned to the 1603 version. Wikimedia Commons has media related to Coats of arms of Queen Anne of Great Britain. The Acts of Union 1707 created the Kingdom of Great Britain (1707–1800). The Royal Arms of England and Scotland are impaled (as for a married couple) and moved to the first and fourth quarters, France second quarter and Ireland third quarter. Wikimedia Commons has media related to Coats of arms of King George I of Great Britain. Wikimedia Commons has media related to Coats of arms of King George II of Great Britain. Wikimedia Commons has media related to Coats of arms of King George III of Great Britain. The Elector of Hanover inherited the throne following the death of Queen Anne under the provisions of the Act of Settlement 1701, becoming King George I. The fourth quarter of the arms was changed to reflect the new King's domains in Hanover (Brunswick–Lüneburg, surmounted by the Imperial Crown of the Holy Roman Empire for the Holy Roman office of Archbannerbearer/Archtreasurer). The Acts of Union 1800 united the Kingdoms of Great Britain and Ireland. At the same time, King George III abandoned his ancestors' ancient claim to the French throne (France had become a republic). The Royal Arms changed, with England now occupying the first and fourth quarters, Scotland the second, Ireland the third. The Royal Arms used in Scotland has Scotland occupying the first and fourth quarters, England the second, Ireland the third. For the Electorate of Hanover, there is an inescutcheon surmounted by the electoral bonnet. The Arms of Hanover were similar, but lacked the electoral bonnet. Wikimedia Commons has media related to Coats of arms of King George IV of the United Kingdom. Wikimedia Commons has media related to Coats of arms of King William IV of the United Kingdom. The electoral bonnet was replaced by a crown in 1816, as Hanover had been declared a kingdom two years previous. Wikimedia Commons has media related to Coats of arms of Queen Victoria of the United Kingdom. The accession of Queen Victoria ended the personal union between the United Kingdom and Hanover, as Salic law prevented a woman from ascending the Hanoverian throne. The escutcheon of Hanover was removed and the Royal Arms remained the same. There was no attempt to alter the Royal Arms to reflect later titles acquired by the British monarch such as Emperor of India. The harp of the Kingdom of Ireland remained despite partition in 1921, to represent Northern Ireland. 1952–present The Irish harp was modified to a plain Gaelic harp, rather than a winged female [as above], in 1952 in accordance with the personal preference of Queen Elizabeth. The Royal Arms do not incorporate any specific element for Wales, a principality, incorporated into the Kingdom of England under Henry VIII. However, the Prince of Wales places arms for Wales at the centre of his personal arms. Members of the British royal family are granted their own personal arms which are based on the Royal Arms. Only children and grandchildren in the male line of the monarch are entitled to arms in this fashion: the arms of children of the monarch are differenced with a three-point label; grandchildren of the monarch are differenced with a five-point label. An exception is made for the eldest son of the Prince of Wales, who bears a three-point label. Since 1911, the arms of the Prince of Wales also displays an inescutcheon of the ancient arms of the Principality of Wales. Queens consort and the wives of sons of the monarch also have their own personal coat of arms. Typically this will be the arms of their husband impaled with their own personal arms or those of their father, if armigerous. However, the consorts of a Queen regnant are not entitled to use the Royal Arms. Thus Prince Philip, Duke of Edinburgh has been granted his own personal arms. Charles, Prince of Wales, outside Scotland The coat of arms of the Prince of Wales is based on the Royal arms with the plain three-point label, augmented by an inescutcheon in honour of the traditional arms of the Principality of Wales. The Prince of Wales's feathers, the Red Dragon of Wales, Sable fifteen Bezants Or (the arms of the Duke of Cornwall, his subsidiary title in England) and his motto Ich dien are also added below the shield and the supporters. In Scotland, his arms as the Duke of Rothesay are displayed rather than those of the Prince of Wales. Charles, Duke of Rothesay (Prince of Wales), in Scotland Used in Scotland, the arms of the Duke of Rothesay are those of Clan Stewart of Appin adapted, namely the quartered arms of the Prince and Great Steward of Scotland and Lord of the Isles (secondary titles of the Duke) with an inescutcheon as Scottish heir apparent (the Royal Arms of Scotland with a blue three-point label). Prince William, Duke of Cambridge Three-point label with a red escallop, alluding to the patrilineal arms of his mother, Diana, Princess of Wales. Prince Harry, Duke of Sussex Five-point label with three red escallops in alternate points, alluding to the patrilineal arms of his mother, Diana, Princess of Wales. Anne, Princess Royal Three-point label, the points bearing a red cross, a red heart and a red cross. Prince Andrew, Duke of York Three-point label, the centre point bearing a blue anchor. Princess Beatrice of York Five-point label with three bees in alternate points. Princess Eugenie of York Five-point label with three thistles in alternate points. Prince Edward, Earl of Wessex Three-point label, the centre point bearing a Tudor rose. Prince Richard, Duke of Gloucester Five-point label, the first, third and fifth points bearing a red cross, the second and fourth points bearing a red lion. Prince Edward, Duke of Kent Five-point label, the first, third and fifth points bearing a blue anchor, the second and fourth points bearing a red cross. Princess Alexandra, The Hon. Lady Ogilvy Five-point label, the first and fifth points bearing a red heart, the second and fourth points bearing a blue anchor, and the third bearing a red cross. Prince Michael of Kent Five-point label, the first, third and fifth points bearing a red cross, the second and fourth points bearing a blue anchor. Prince Philip, Duke of Edinburgh Prince Philip's arms post-1949 comprise four quarters, Denmark, Greece, and Mountbatten, representing his ancestry, and Edinburgh, representing the territorial designation of his dukedom. Camilla, Duchess of Cornwall The arms of the Prince of Wales impaled with those of her father, Major Bruce Shand, crowned with the single-arched Coronet of Prince of Wales. Catherine, Duchess of Cambridge The arms of the Duke of Cambridge impaled with those of her father, Michael Middleton, crowned with the coronet of a child of the heir-apparent. Meghan, Duchess of Sussex The arms of the Duke of Sussex impaled with those of her own design, crowned with the coronet of a child of the heir-apparent. Sophie, Countess of Wessex The arms of the Earl of Wessex impaled with those granted in 1999 to her father, Christopher Rhys-Jones, with remainder to his elder brother Theo. The new grant was based on an unregistered 200-year-old design. The lion alludes to one of the Countess' ancestors the Welsh knight Elystan Glodrydd, prince of Ferrig. Birgitte, Duchess of Gloucester The arms of the Duke of Gloucester with an escutcheon of pretence granted to her by Royal Warrant on 18 July 1973. Katharine, Duchess of Kent The arms of the Duke of Kent impaled with those of her father, Sir William Arthington Worsley, 4th Baronet. Princess Michael of Kent The arms of Prince Michael of Kent impaled with those of her father, Baron Günther Hubertus von Reibnitz. The version used by the British Government. The version used by the Scotland Office. Various versions of the Royal Arms are used by Her Majesty's Government in the United Kingdom, the Parliament of the United Kingdom and courts in some parts of the Commonwealth. HM Government generally uses a simplified version of the Royal Arms with a crown replacing the helm and crest, and with no compartment. In relation to Scotland, the Scotland Office and the Advocate General for Scotland use the Scottish version, again without the helm or crest, and the same was used as the day-to-day logo of the Scottish Executive until September 2007, when a rebranding exercise introduced the name Scottish Government, together with a revised logo incorporating the flag of Scotland. The Scottish Government continues to use the Arms on some official documents. on all acts of the Anguilla House of Assembly, the Sovereign Base Areas, Pitcairn Islands and South Georgia and the South Sandwich Islands administrations. A version of the crest of the Royal Arms, as used in Scotland, is used by the Crown Office and Procurator Fiscal Service, the General Register Office for Scotland and the Royal Commission on the Ancient and Historical Monuments of Scotland. The crowned shield of the Royal Arms encircled by the Garter is used by the Home Office and by the Parliament of Victoria. The crowned shield of the Royal Arms is used by the Royal Mint. The Royal Arms with the crest but without the helm is used as the rank insignia for Class 1 Warrant Officers in Her Majesty's Armed Forces. ^ p. 10, Government identity system (2012). HM Government. "The Queen is Head of State, and the United Kingdom is governed by Her Majesty’s Government in the name of the Queen. 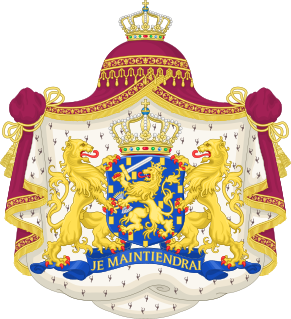 The royal coat of arms is personal to the Queen and..."
^ a b c d e f g h i j k l m n o p q r s t u v w x y Brooke-Little, J.P., FSA (1978) . Boutell's Heraldry (Revised ed.). London: Frederick Warne LTD. pp. 205–222. ISBN 0-7232-2096-4. ^ "Heraldic Sculptor- Accessed 29 April 2008". ^ "Traditions of the courts". Courts and Tribunals Judiciary. Retrieved 2 January 2017. ^ Treasures of Britain and Treasures of Ireland (1976 ed.). Drive Publications. p. 677. Retrieved 15 March 2014. 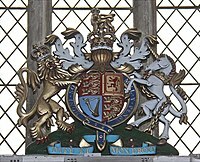 ^ "Royal Arms in church". Intriguing History. Retrieved 31 July 2015. ^ Summers, Michael; Streeter, Ben (24 March 1997). "The strange case of Lady Thatcher and Her Majesty's coat of arms". The Independent. Retrieved 20 July 2017. ^ Hanley, Hugh (2015). "'The Last Shadow': Negotiating the Great Seal and Direct Access to the King, 1931". Irish Studies in International Affairs. Royal Irish Academy. 26: 257–274 : 266. doi:10.3318/isia.2015.26.13. JSTOR 10.3318/isia.2015.26.13. ; Walshe, Joseph (26 October 1937). "Memorandum on external seals". Documents on Irish Foreign Policy, Vol. V No. 97. Royal Irish Academy. Retrieved 20 September 2011. ^ Petchey, W.J., Massachusetts (1967). A Short Account of the Armorial Bearings of the Sovereigns of England. London: National Council of Social Service. ^ Scotland was formally reunited with England by an Ordinance of 12 April 1654 which ordered: "That the arms of Scotland viz: a Cross commonly called the St Andrew's Cross be received onto and borne from henceforth in the Arms of this Commonwealth ... etc". 'April 1654: An Ordinance for uniting Scotland into one Commonwealth with England. ', Acts and Ordinances of the Interregnum, 1642-1660 (1911), pp. 871-875. URL: http://www.british-history.ac.uk/report.aspx?compid=56540&strquery=arms Date accessed: 1 January 2011. ^ Friar, Basic Heraldry (1993). ^ British Royal Standards since 1801 David Prothero and Martin Grieve. Retrieved 13 May 2011. ^ a b College of Arms. "College of Arms - the coat of arms of TRH Prince William and Prince Henry of Wales". Archived from the original on 27 May 2008. Retrieved 17 April 2010. ^ "Camilla's coat of arms unveiled". 17 July 2005 – via news.bbc.co.uk. ^ "Coat of Arms of Duchess of Cambridge". dukeandduchessofcambridge.org. 14 November 2012. Archived from the original on 6 November 2012. ^ "Her Royal Highness The Duchess of Sussex: Coat of Arms". The Royal Family. 25 May 2018. Retrieved 25 May 2018. ^ Sophie's new coat. BBC News. 19 May 1999. Retrieved 14 November 2010. ^ Boutell, Charles; Brooke-Little, John Philip (1978). Boutell's Heraldry (8th revised ed.). Frederick Warne. p. 226. ISBN 9780723220961. ^ "Court of Appeal - Hearing List". www.courts.gov.bc.ca. ^ "Provincial Court of British Columbia". www.provincialcourt.bc.ca. ^ "SUPREME COURT ACT 1935 - SECT 15". www.austlii.edu.au. ^ Victoria, Supreme Court of Victoria, State Government of. "Home". www.supremecourt.vic.gov.au. ^ "Parliament of Victoria - Home". www.parliament.vic.gov.au. Wikimedia Commons has media related to Royal Arms of the United Kingdom. The coat of arms of Prince Edward Island was begun when the shield and motto in the achievement were granted in 1905 by royal warrant of the King Edward VII. The Royal Standards of the United Kingdom refers to either one of two similar flags used by Queen Elizabeth II in her capacity as Sovereign of the United Kingdom and its overseas territories. Two versions of the flag exist, one for general use in England, Northern Ireland, Wales and overseas; and the other for use in Scotland. The coat of arms of British Columbia is the heraldic symbol representing the Canadian province of British Columbia. The arms contains symbols reflecting British Columbia's British heritage along with local symbols. At the upper part of the shield is the Union Jack, representing the United Kingdom. The lower portion of the shield features a golden sun setting into the ocean, representing the province's location on the Pacific. The coat of arms of New Zealand is the heraldic symbol representing the South Pacific island country of New Zealand. Its design reflects New Zealand's history as a bicultural nation, with a European female figure on one side and a Māori rangatira (chief) on the other. The symbols on the central shield represent New Zealand's trade, agriculture and industry, and a Crown represents New Zealand's status as a constitutional monarchy. The Royal Banner of the Royal Arms of Scotland, also known as the Royal Banner of Scotland, or more commonly the Lion Rampant of Scotland, and historically as the Royal Standard of Scotland, or Banner of the King of Scots, is the Royal Banner of Scotland, and historically, the Royal Standard of the Kingdom of Scotland. Used historically by the Scottish monarchs, the banner differs from Scotland's national flag, the Saltire, in that its correct use is restricted by an Act of the Parliament of Scotland to only a few Great Officers of State who officially represent the Monarchy in Scotland. It is also used in an official capacity at royal residences in Scotland when the Head of State is not present. The Coat of arms of New South Wales is the official coat of arms of the Australian state of New South Wales. It was granted by royal warrant of King Edward VII dated 11 October 1906.